I hope you all had a wonderful weekend and are ready for another great week! I wanted to talk about believing in yourself today. Believing in yourself enough to step outside of your comfort zone and taking that leap of faith. It's easy to say that we want to change and easy to say where we want to go or how we want to do it. The major factor in that is the "doing" part. 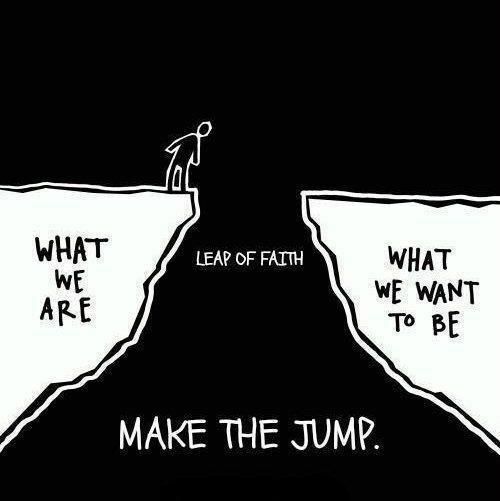 Taking that jump.. believing in yourself enough to say "this is what I want and I AM going to get it". Then actively taking the steps to get there. This can be about anything at all. This can be about eating healthier, going to the gym more, trying to be more social, making family time a priority... basically anything where you are stepping outside of your comfort zone or a place where you may need improvement. Some people say that they don't want to go to the gym because they're worried about what people think or that people might stare at them. Can you honestly look back and remember someone from your last trip to the gym? What someone was doing or what they were wearing? Unless I knew the person, I can't say that I do. It's time to start believing in yourself more and stop caring what other people think. Make yourself a priority and you will thank yourself later! Believe in yourself folks! Become who you want to be!